The State of Missouri requires NCCAOM Certification. Please visit the NCCAOM PDA or CEU page for approved courses. (3) An applicant for licensure based upon certification by the National Commission for the Certification of Acupuncture and Oriental Medicine (NCCAOM) shall be currently certified as a diplomate in acupuncture by NCCAOM. The applicant shall be responsible for authorizing NCCAOM to verify certification to the advisory committee and verification of certification shall be sent to the advisory committee by NCCAOM. (A) An applicant for licensure with a course of study from a school or program outside the United States may be considered in compliance with these rules if the applicant is certified as a diplomate in acupuncture by NCCAOM. 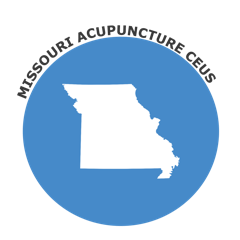 Please see page 2, for more details regarding Missouri Acupuncture Board rules & regulations for acupuncture license renewal. (3) Prior to the expiration date of the license and as a condition of the license renewal, a licensed acupuncturist shall complete thirty (30) hours of continuing education within the two (2)-year licensure period. Continuing education shall be related to the practice of acupuncture and include universal precautions/infection control and cardiopulmonary resuscitation (CPR) certification. For the first year of licensure continuing education hours shall not be required. Please see page 2 for more details regarding Missouri Acupuncture Board Rules & Regulations for acupuncture license renewal.